As Michaelmas Term begins, freshers arrive and leavers empty their rooms after their final summer concerts as members of the Choir. Our first main priority with the group is to teach the freshers as much of the standard concert music as possible so that they can start participating in performances as soon as possible. And indeed, despite the balmy overhang of the previous summer, our eyes are already set on Christmas, three months away. The first annual engagement every year is a large (free) concert in King’s Hall of Christmas repertoire, normally held in the first week of December at the end of the Michaelmas Term. Moreover, as we stay in Cambridge after term ends to record Carols from King’s for BBC television anyway, this allows us to do our annual carol concert at the Eagle pub in return for a healthy (or unhealthy, perhaps) tab behind the bar, and to sing to the patients at Addenbrooke’s hospital who cannot get back to their homes at Christmas—always a rewarding experience. On Christmas Eve, we often have a BBC broadcast in the morning, with just the men of the choir, on top of the more famous Festival of Nine Lessons and Carols later in the day. After a two-hour rehearsal for that, we go out and serenade the queue (some members of which have been braving the elements for a couple of days to ensure good seats) with our close-harmony Christmas fare, before a hearty brunch. All of the repertoire on this disc has been performed at these Christmas events in recent years. The real climax of the King’s Men’s year comes when we go on our annual national tour (usually in the Easter holidays) and perform nine or ten concerts over the course of about as many days. The sequence of music in our concerts is in a tried and tested format of four quarters (interspersed with an interval and some light contributions from our organ scholars), covering the whole range of our repertoire. We start off with early sacred music of the 16th and 17th centuries, moving to arrangements of folk-songs in the second quarter. After the interval we have traditional spirituals and jazz before moving on to the more popular repertoire to close. It’s an eclectic mix, but it does work. Each piece is preceded by a short, spoken introduction, by one of our number, and we endeavour to make these humorous (our comic expertise, it must be said, is somewhat limited). This CD, mercifully, is presented without those interjections! After exams comes the onslaught of May Balls—a week or so where all semblance of a decent sleeping pattern goes out of the window. We perform in groups of seven, and sometimes we might have to sing at three different balls in one night, ending at about 5 o'clock in the morning. We always have an outrageously good time, and there is often the option to get a coveted ticket to the ball you are performing at—it’s a fine deal. On the Sunday at the end of May Week we perform a concert called Singing on the River, where the audience sits on one side of the river Cam and we perform (with microphones) across the river, from the other side, on punts. The weather nearly always, miraculously, holds out and we usually present the same programme that we toured, meaning that we know the music well enough not to be put off by ducks, high winds, and the ever-present possibility of falling in. It never fails to draw in a great audience—sometimes well over 1,000. 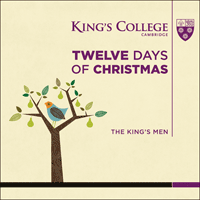 The decision to record this disc came after the great success of the previous King's Men recording, After Hours, which reached No 1 in the iTunes Classical Charts in 2014. The group learned so much from the experience of recording and releasing After Hours that we wanted to keep up the momentum, and build on the success of the previous album. Every year The King's Men gives a large number of Christmas performances, and over many years has amassed a great number of excellent Christmas arrangements. Though some of these were on a previous recording from the 1980s, we felt it was time to record some of them afresh, and add to them some newer and more up-to-date arrangements. So we set to work compiling a list of arrangements and making plans to record Twelve Days of Christmas in the 2014-15 academic year. We were particularly pleased to be able to model these recording sessions on the ones for After Hours, and we were fortunate to be able to use our 'in-house' producer, Benjamin Sheen, with whom we had worked back in 2013, and engineer Matthew Dilley, who has come to understand the way in which The King's Men works, and the sound we strive to attain. There was close discussion between the musical directors, Patrick and Philip, and Ben Sheen, about how we would approach the recording—about venues, recording styles, balance of repertoire, and about the actual sound we wanted from the group. These discussions led to several coaching sessions from Ben Parry—Assistant Director of Music at King's, Director of the National Youth Choirs of Great Britain, and former member of The Swingle Singers. Ben's advice and coaching was invaluable, and he helped the group to leave behind some of the habits of being a Choral Scholar in the Chapel, and instead inhabit a more 'pop' style of singing. Working in detail with Ben led us to think carefully about our approach to each song. Even between those in a similar genre, we began to think about the precise atmosphere we wanted to create, and about which choral and vocal techniques we could employ (some of which were very much out of our comfort zone as choral scholars) to create this mood. Sometimes we wanted to evoke a cosy fireside scene—a glass of sherry, a comfy armchair, and a Christmas tree in the corner. Other times, we wanted to evoke a more sassy and 'cool' feeling, for tracks such as Santa baby and All I want for Christmas is you. Ben's vast experience, as both a singer and choral director, greatly helped us find these sounds for the disc, and for his help we are extremely grateful. In deciding exactly how we would record the group in these sessions, we had several factors in mind. Firstly, we wanted the disc to reflect a live performance by The King's Men. To achieve this, we recorded everything 'live', meaning that the whole group was present, and standing together in the formation we would for a concert; we decided none of the tracks warranted a studio recording, as the sound of the group altogether, in a real acoustic, suited the music better. Secondly, we wanted to make sure every singer's individual sound was able to be heard and appreciated, and this informed two decisions about the recording: several tracks were recorded with reduced forces (between 7-10 people, rather than the full 15), so we were singing 1-per-part for a more intimate feel; additionally, we decided to give every singer in the room an individual microphone, so that, even in the full chorus tracks, the blended overall sound would still consist of everyone's own voices and personality. Thirdly, we wanted to have fun during the sessions! So, we took with us to the church a Christmas tree, some decorations, and a handful of Santa hats for good measure. I hope you have as much fun listening to the disc as we had recording it!